Between my 5 years in Saudi Arabia and 2 odd years in the UAE, I have developed an appreciation for Arabic food. 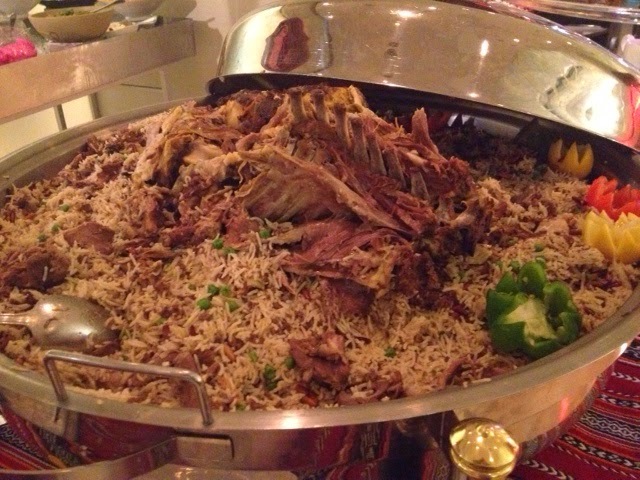 It started in Saudi when my students would invite me to dig into a large metal plate filled meat and beautifully spiced rice, generically called kabsa. 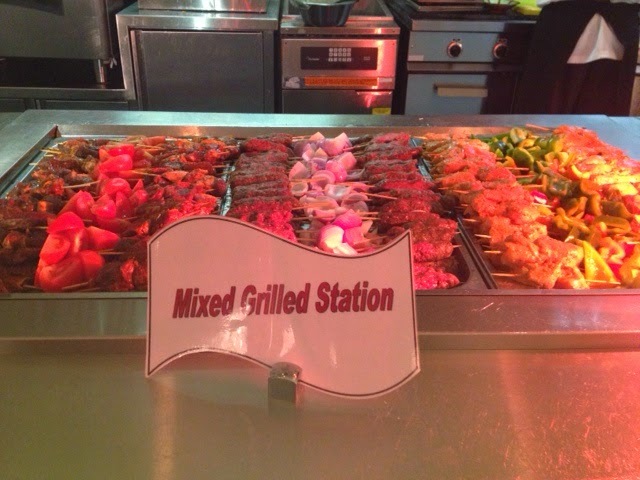 It was also there that I came to appreciate the subtle nuances of the different variations of the rice and meat. 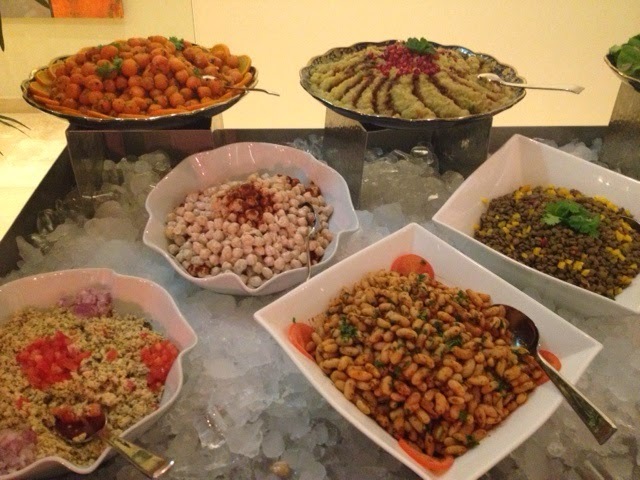 So, when the opportunity to experience my first Arabic theme night came up, I willingly expressed enthusiasm and attended such a theme night at Grand Millenium Al Wahda's All day Dining restaurant in Abu Dhabi. On the night I visited I got lucky because the restaurant had 90% occupancy that night due to the U17 International Football tournament in Abu Dhabi, and there were 8 football teams staying at the hotel. It meant therefore that a typically lively Arabic dinner would ensue, especially since the UAE, Egypt and Morocco were represented. The ouzi on rice - the lamb melted off the bone! 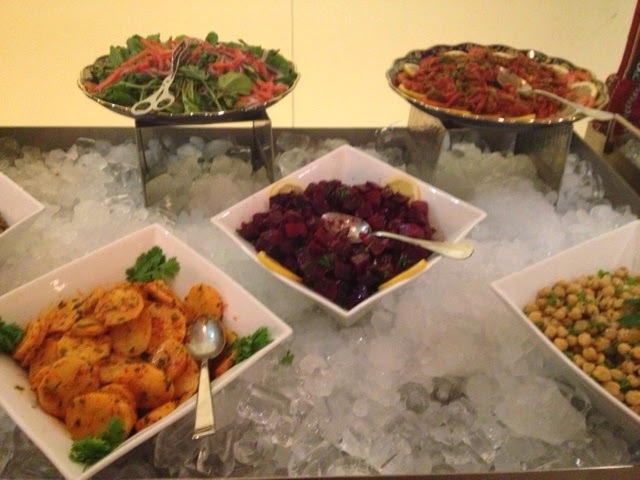 There was a rich selection of Arabic mezze and other salads. I spotted at least 5 salads that had pomegranate in them. The sour tang of pomegranate and the sensuous colour, make these seeds a wonderful part of an Arabic salad. All your typical foreigner favourites are here: Dolma (rice-stuffed vine leaves), Hummus (mashed chick peas blended with tahini) and baba ganoush (eggplant blended with other vegetables like diced onions and tomatoes and can be served with olive oil and pomegranate). There was also a selection of olives from the Middle East and Mediterranean, pickles, etc. 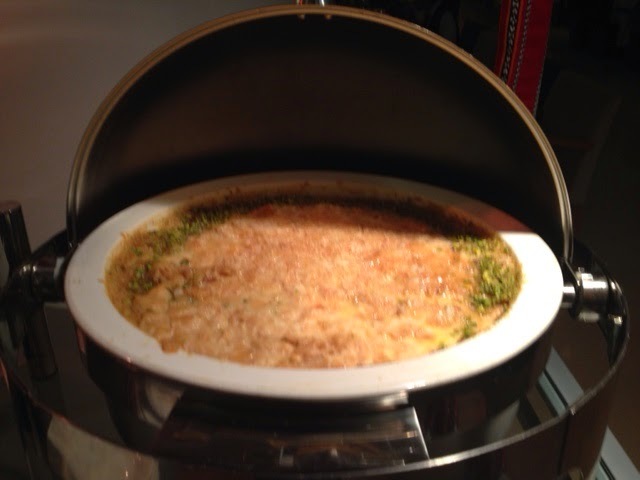 However, the centre piece in my mind was a huge silver serving bowl filled with a rich rice and meat dish named ouzi on oriental rice (lamb and rice). 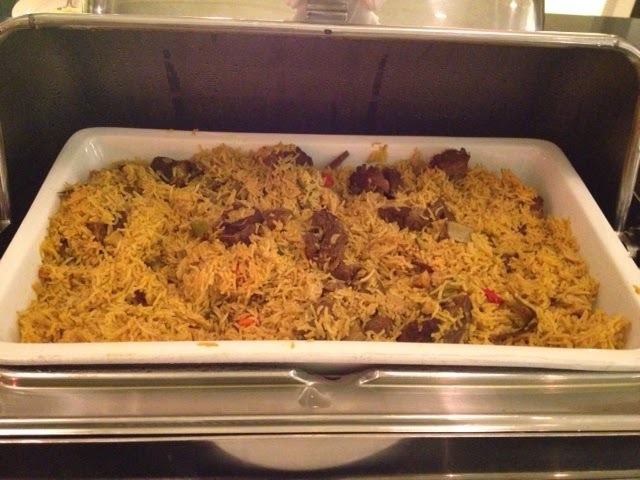 There are many other dishes on display, including some international dishes for those needing a break from the Arabic theme - however, then why would you be here, I wonder. 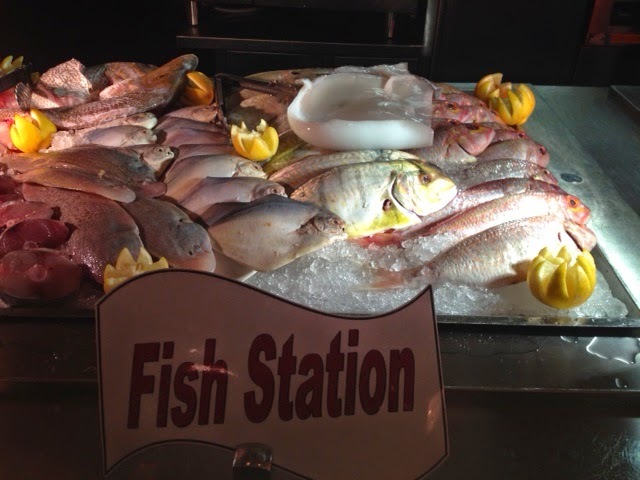 Finally, there is a choice of fish and meat for grilling. The highlight of my evening was undoubtedly my interaction with the head Chef Abdulmajeed who prepared a marvelous fish plate for me consisting of cuttlefish and baracuda. At my request he made it spicy, but rather than use dry chili, he used fresh red and green chili. It tasted superb. Hot and spicy but delicious. He also showed me around the dessert station, explaining some of the origins of the desserts on display. 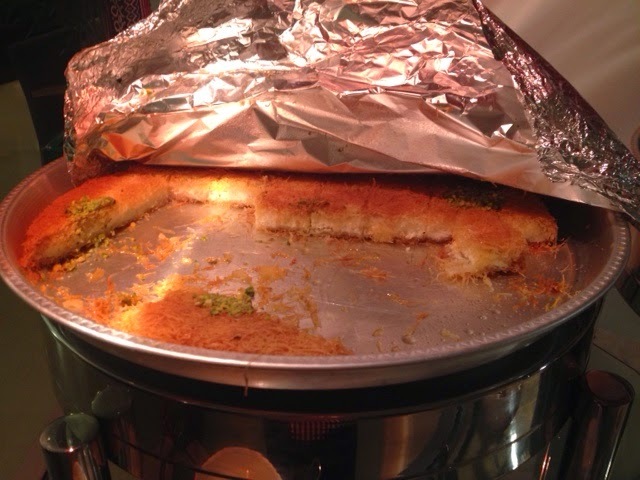 For dessert I has the kanafeh (cheese pastry soaked in syrup and topped with pistachios) and of course the um ali ( a bread pudding made of pastry, cream, nuts and dried fruit). 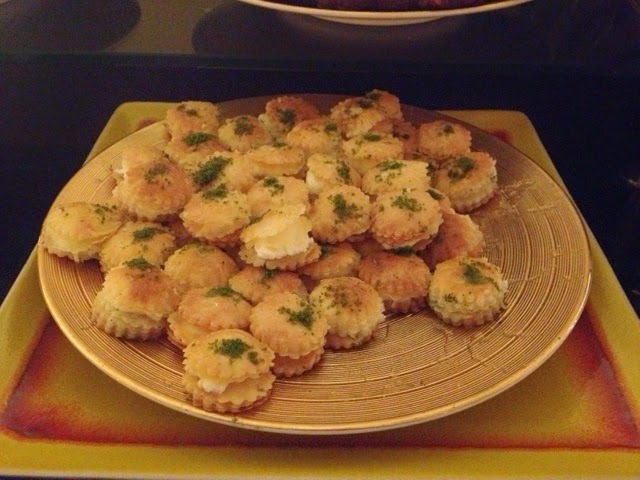 I was surprised by the balanced sweetness, something I celebrated as both desserts, especially the om ali, can be quite sweet. Mumtaz! Um Ali, a dessert that can be very sweet, but Chef got this right. Chef showed the importance of engagement with the guest. He showed the value ofthis type of interaction and the effect it can have on guests. When I think back on this night, my mind will inevitably drift to how the chef shared his passion for his art and his passion for his cooking with a guest who up to that point aimlessly moved from dish to dish. He provided context and showed that passion in the kitchen extends beyond the boundaries of the grill station - it can touch the guests too. And that is what guests look for, not just dishes!